LAS VEGAS, NV--(Marketwired - Dec 29, 2014) - Tucked away inside the Renaissance Las Vegas Hotel, ENVY Steakhouse sets the stage for vibrant culinary expression, and its star chef is the main attraction. Throughout his time at the award-winning steakhouse, Executive Chef Christophe Mihy's global culinary experience has led ENVY to unleash wholly new dining concepts and flavors, resulting in an ever-changing menu that's uniquely modern and boldly fresh. 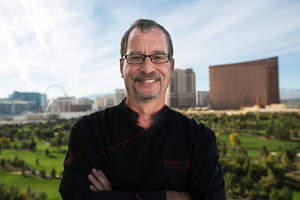 Following a 35-year culinary career that spanned four countries and countless five-star hotels, Chef Mihy joined the Renaissance Las Vegas Hotel in 2007. The creative visionary behind ENVY and its focus on fresh, seasonal fare, Chef Mihy ignites his team with his warmth and unwavering work ethic, which shows in every corner of the beloved Las Vegas steakhouse. "We are honored to have Chef Mihy's culinary vision guiding the path of ENVY and the Renaissance Las Vegas," said Nato Giordano, Vice President of Culinary Operations for Crescent Hotels & Resorts, which operates the four-diamond hotel. "His years of experience, unique style and taste have set the stage for many more years of exciting and innovative cuisine to come." In his role as Executive Chef of the luxury hotel, Chef Mihy oversees all food & beverage operations and continues his distinguished and adventurous career at one of the only non-smoking, non-gaming hotels near the strip. His culinary journey began in the most prestigious environments, training with world renowned chefs spanning France and the United States in Michelin star rated restaurants. His most notable instruction came from "Chef of the Century" Joel Robuchon at the legendary Jamin in Paris. His career eventually led him to take the helm at several four and five star restaurants as far away as the French West Indies and off the coast of Africa in Mauritius Island. At ENVY, his focus is on the finest cuts and the freshest, local ingredients, using them to craft a menu that's seasonal and innovative from the very first bite. ENVY sources from some of the best purveyors in the country, and offers a wine wall and cellar featuring more than 1,500 bottles of wine. Its award-winning menu has cemented its status as one of the best steakhouses in the country, a vision that Chef Mihy and his team bring to life every day. A dramatic departure from the traditional, the Renaissance Las Vegas Hotel offers a quietly cool, boutique environment with luxurious amenities to enhance relaxation at every turn. Just blocks from the famed Las Vegas Strip and adjacent to the Convention Center, this four diamond, hotel in the heart of the city is the largest smoke-free, non-gaming facility in the area. With its sleek style, spacious accommodations and caring service, travelers can enjoy its unique blend of Las Vegas luxury, quiet comfort and culinary discoveries. From Angus filet and bone-in rib eye, to dishes made with locally sourced ingredients, ENVY is one of the best steakhouses in Las Vegas, while the new Grill 55 offers affordable comfort food and seasonal cocktail menus. Here, travelers can escape to the Entertainment Capital of the World and rediscover how subtly sophisticated a hotel near the strip can be, while enjoying easy access to everything in the city. Chef Mihy has been the creative visionary behind Renaissance Las Vegas' ENVY Steakhouse and its focus on fresh, seasonal fare since 2007. Follow Renaissance Las Vegas on Facebook!